The MG 42 (shortened from German: Maschinengewehr 42, or "machine gun 42") was a general-purpose machine gun. It was created in Nazi Germany. It began being used by the Wehrmacht in 1942. It was used with (and sometimes replaced) the MG 34 machine gun in the German Armed Forces. Both weapons were made and used until the end of the war. The MG 42 was known for being reliable, simple and easy to use. However, it is best known for its very high rate of fire so the Germans called it "Hitlersäge", or "Hitler's saw". There were other automatic weapon designs with similar firepower. Some examples of these are the French Darne, the Hungarian-Gebauer, the Russian 7.62mm ShKAS and the British Vickers K machine gun. However, because the MG 42 got its ammunition from a belt and its barrel was easy to change, it could fire for longer periods of time than these weapons. The MG 42 was used to create new weapons after Nazi Germany surrendered. The MG1 (MG 42/59) was nearly exactly the same as the MG 42. The MG1 became the MG1A3, which in turn became the MG 3. The Swiss MG 51, SIG MG 710-3, Austrian MG 74, and the Spanish 5.56mm Ameli light machine gun were all designed from the MG 42. The M60 and Belgian MAG also copied some features. 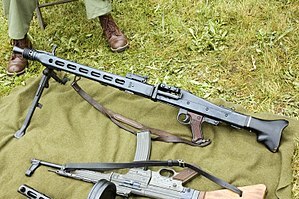 The MG 42 was still used by many armed groups after the war. A German SS soldier with an MG 42, France, 1944. During the 1930s, the German Army began using the MG 34. The MG 34 was thought to be the first general-purpose machine gun. The MG 34 had a barrel that could be changed quickly. It was also able to fire from big magazines or a belt. This meant that the MG 34 could fire for much longer than weapons like the Browning Automatic Rifle, Japanese Type 11, British Bren and French Châtellerault LMG. It was also much lighter than weapons like the Vickers machine gun and M1917 Browning machine gun. The MG 34 was also very changeable. It was able to fire from a belt and a drum magazine. It could also be fired from tripods or from armoured vehicles. It even became one of the main defensive guns for the Luftwaffe as the MG 81. It was also used as a second gun on tanks as the MG 34 Panzerlauf. However, the MG 34 did have some problems. An example of this is that the MG 34 broke down easily if it got dust on it. It was also quite expensive to make. The MG 34S was made as an improvement to the design. So that these problems could be fixed, a contest was started to find a replacement for the MG 34. Three companies were asked to design this replacement. These were: Metall und Lackierwarenfabrik Johannes Großfuß AG, Rheinmetall-Borsig, and Stübgen. Großfuß AG's design turned out to be the best. Strangely, Großfuß did not make weapons. They mostly made metal lanterns. Ernst Grunow was one of the head design engineers with Großfuß. He did not know anything about machine guns when he was told he would be involved in the project. However, he knew a lot about the machines used to make a lot of a product (mass production). Grunow went to an army machine gunner's training course to help him understand machine guns more. He also asked some soldiers for information. He then used some ideas used by Mauser and added some features he learned about from talking to army machine gunners and things that happened early on in World War II. The new design, the MG 42, was much easier to build. It took 75 hours to make the new gun. However, the MG 34 took 150 hours. The new gun cost 250 RM. However, the MG 34 cost 327 RM. The MG 42 was also made out of stamped metal. This made it easier to make than other machine guns. This gun ended up being called the MG 39. It was similar to the MG 34 overall. To the gunner, the only large change was that it could not fire from drum magazines anymore. This meant that the weapon had to fire from a belt or from a drum-shaped magazine that attached to the side of the gun and had a belt inside it. The weapon was officially brought into service. The weapon began being made in 1942 as the MG 42. Großfuß, Mauser-Werke, Gustloff-Werke and some others were given contracts to make the MG 42. The MG 42 had a very high rate of fire. It could fire about 1,200 rounds per minute. This was twice the rate of the British Vickers machine gun and American Browning. Soldiers were so terrified of the MG 42 that the United States Army made training movies to help the soldiers deal with the fear of going against the MG 42 in battle. At such a high rate, the human ear can not easily hear the sound of a single bullet being fired. This meant that the gun made a sound similar to "rrrrp". Allied soldiers nicknamed the MG 42 "Hitler's Buzzsaw". When the MG 42 was fired for a long amount of time, it used a lot of ammunition. Because of this, a German MG 42 gunner would usually only fire the weapon in short bursts. Because of the way the barrel was changed, the MG 42 could not be used on World War II German tanks. However, it could be used on one tank. This tank was called the Jagdpanzer IV. During World War II, every German machine gun squad had an MG 42. An MG 42 on a tripod. The MG 42 weighed 11.8 kg. This was lighter than the MG 34. The MG 42 usually had a crew of six. These people were: the gun commander (the person who told the No.1 what to do with the gun), the No.1 who carried and fired the gun, the No.2 who carried the tripod, and Nos.3, 4, and 5 who carried ammunition, extra barrels and tools to dig foxholes in the ground. This big team was often cut to just three: the gunner, the loader (who loaded ammunition into the weapon and carried the barrels), and the spotter (the person who spotted targets for the gunner to shoot at). The leader of the squad and his assistant were given MP-40 submachine guns. The MG 42 was used on nearly all German armoured vehicles. In combat, the gun's barrel could be changed in seconds. The MG 42 was also very durable. To keep the gun working, all that was needed was some oil. The MG 42 could be dropped in mud or water and still work. The job of many German riflemen was to support the machine gun. If the MG 42 and its crew moved, the riflemen would cover them to keep them safe. When the crew set up the MG 42, the riflemen would dig holes in the ground for the MG 42 crew to sit in. While the MG 42 was firing, the riflemen would carry ammunition to the gunners. An MG 42 being used in a battle would usually use 3,000 rounds per day. The MG 42 fires belt fed 7.92mm cartridges from an open bolt. The MG 42 can only fire fully automatically. Single shots are very difficult even for people who are experienced with the MG 42. This is because of the weapon's high rate of fire. The MG 42 barrel can be changed quickly. It has a device in the barrel to make this easier. This feature is similar to the Thompson Light Rifle. 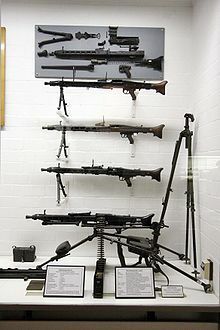 Many different kinds of MG 42. In 1944, the Third Reich were getting short of materials. This led them to develop the MG 45 (or MG 42V). It had an even higher rate of fire and was easier to make. The American military tried to copy the MG 42 during the war. They thought it could be a possible replacement for the Browning Automatic Rifle and the M1919A4 for foot soldiers. Saginaw Steering Gear made a prototype and called it the T24 machine gun. However, it was realised that the .30-06 cartridge that the gun would fire might be too long. There was also a design problem with the prototype. These problems meant that the project was ended. Yugoslavia built the MG 42 at the Zavodi Crvena Zastava company as the M53 machine gun. They did this under a license. This gun still fired the 7.92 x 57mm Mauser cartridge. By doing this, the M53 was nearly an exact copy of the German MG 42. The only big difference is that the rate of fire is lower than the MG 42. Some M53s were sent to Iraq in the 1980s. They were also used a lot during both of the Gulf wars. M53 was known under nickname Šarac. The Beretta MG 42/59 was just the MG 42 with some small changes. This is still used by the Italian Army. The Rheinmetall MG 3 is also just the MG 42 with some changes. The MG 3 is used with the German armed forces (Bundeswehr). An MG 74 used by the Austrian Federal Army. The last type of MG 42 is called the MG 74. It was developed in Austria. It has been the main machine gun of the Austrian Armed Forces since 1974. ↑ 5.0 5.1 5.2 Willbanks, James: Machine Guns: An Illustrated History of Their Impact, page 115. ABC-CLIO, 2004. ↑ "Automatic Weapons: American vs. German". US War Department Film Bulletin No. 181. ↑ "Machine Gun 42". 17 January 2009. ↑ G3 Defence Magazine August 2010. En.calameo.com (2010-08-04). Retrieved on 2010-10-18. ↑ "1945–1970 (Zavodi crvena zastava)" (in Serbian). Zastava. Retrieved 2010-10-10. 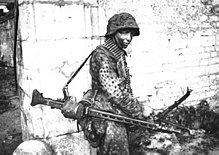 Wikimedia Commons has media related to MG 42.